The city’s award-winning principal bus operator, Nottingham City Transport, is working in partnership with Nottingham City Council to launch a 3-year project which could see Nottingham become the UK’s ‘greenest’ city for public transport. Nottingham City Transport has applied for a £6.5m grant from the OLEV Low Emission Bus Scheme to complement a £19m investment being made by NCT in order to introduce 82 bio-gas double deckers to the fleet over 3 years from October 2016. DEFRA – The Department for Environment, Foodand Rural Affairs – recommended the Nottingham Urban Area needed to consider low emission zones and vehicles to reduce emissions and improve air quality. The introduction of the bio-gas buses will support these aims, building on the electric buses, the tram and the City Council’s ambitions to introduce electric taxis and new charging points for electric cars. OLEV, or The Office for Low Emission Vehicles, is a team working across Government to support the early market for ultra-low emission vehicles (ULEV). It is providing over £900million to position the UK at the global forefront of ULEV development, manufacture and use. This will contribute to economic growth and will help reduce greenhouse gas emissions and air pollution on UK roads. If approved, the £6.5m NCT has applied for will contribute towards the cost of each bus and the infrastructure cost of installing gas fuelling facilities at NCT’s Parliament Street Garage. “The new gas buses are likely to be the very first gas double deckers in the UK, which is hugely exciting,” adds Anthony Carver-Smith. “They’ll be ADL Scania buses, so they’ll be of the highest quality and using gas buses will enable our customers to reach the heart of the City on one of the cleanest modes of transport available”. 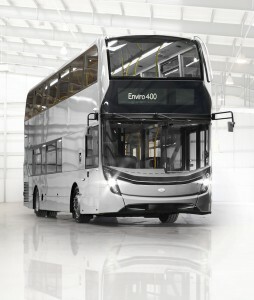 The Scania chassis for each bus will be assembled in Leyland in Lancashire ahead of the bodying by Alexander Dennis in Scotland. Nottingham based company, Roadgas in Colwick, will supply the infrastructure. This £25.5m project, rolled out over 3 years, will replace a quarter of NCT’s current fleet, and it’s estimated that there will be 75 million kilograms less Co2 emitted over the lifetime of the vehicles compared to conventional diesel buses. By 2020 Nottingham’s current UK Bus Operator of the Year will aim for every bus to have either a Euro 5 environmentally-friendly engine or be gas-powered, creating one of the lowest-emission fleets in the UK. A kilogramme of bio-methane gas will be injected into the national gas grid for every kilogramme of gas used by each new bus in the fleet. As such, the entire operation will also qualify for carbon-neutral status. The funding decision will be made by OLEV in January 2016, with the first gas buses on the road by October the same year. Launch of Manchester 'get me there' Smartcard. WHAT LIES BENEATH LONDON'S STREETS?